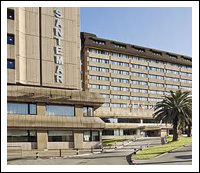 The following hotels are recommended by the conference organizers. Some rooms have been pre-booked for IBERGRID'2011 participants. All of the rooms for the conference will include WIFI, breakfast, and IVA (taxes). To make your hotel reservation, please contact the hotel you choose directly via email or phone. When you contact the hotel tell them you are to make a reservation under GRID (keyword), in order to get the special rate we negotiated. After you make your hotel reservation, please send us an email informing us where you will be staying. 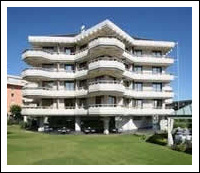 The rooms at the 2 hotels below have been pre-reserved only until April 30, 2011. IMPORTANT:The week of our conference there are also other conferences occurring in Santander, if you book after April 30th we can not guarantee you will get a hotel room. Below is the contact information for each hotel, as well as, some hotel details. All room prices include breakfast and free WIFI throughout the entire hotel. VAT comes on top. All of rooms have a private balcony and most include ocean views.